1969 Chevy Camaro of Rob Dyrdek Up for Sale! - Muscle Cars Zone! 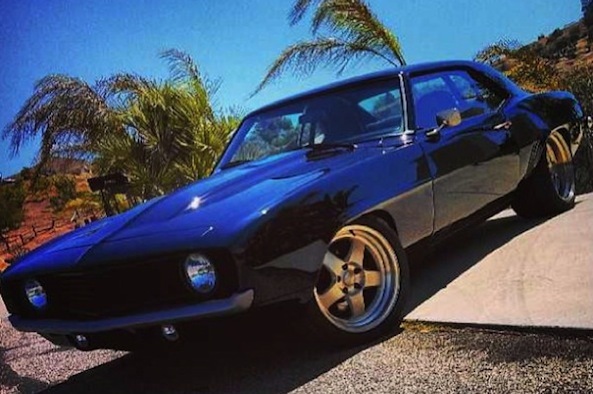 1969 Chevy Camaro of Rob Dyrdek Up for Sale! The skateboarder, Rob Dyrdek famous for his musings on Rob and Big and Fantasy Factory TV shows has very impressive collection of big boy toys. As you may know he is the proud owner of a Ferrari 458, Campagna T-Rex, Chevy Tahoe and and of course 1969 Chevrolet Camaro customized by “All Speed Customs” of Michigan. Now Rob is looking to part ways with his unique Camaro and we are not sure how much this beauty will be sold. Therefore, we invite you to watch the video below where Rob takes the delivery of his Camaro. Wish I could be in his place. This guy has a really good taste in cars! Right? !